This plan for the purchase of an existing small business does a nice job of illustrating, in specifics, how the business will be improved. Dynamic ideas for increasing community involvement and exposure are clearly stated. The low overhead cost of operation and the creative ability of the entrepreneur are stressed as the keys to a successful venture, and both are displayed in the plan's content. Grandma Miller's Cookies & Muffins was established about eight and a half years ago, and the current owner, Hannah Welles, has owned it for about two and a half years, selling it for health reasons. Hannah has an excellent rapport with her customers and is very knowledgeable about the area. Currently, the business shows a modest profit. Although the markup on the cookies is very good (i.e., sugar cookie dough sells for $1.85/lb., and the retail price of the finished cookies is $6.59/lb), the overall cost of goods sold is about 50 percent due to the serving of light lunches, muffins, soda, and juices (see menu). As pointed out by an accountant, any sales over the current volume, 50 percent, is profit. As a result, sales could be doubled within the first twelve to eighteen months. The first of two steps to increase sales would be to become an active member of the Muskegon Chamber of Commerce (membership is over 400). Through past Grand Rapids Chamber membership and previous employment in Muskegon, I have made many business contacts in the area: Electronics Midwest, Rogers H. Theatre, H&G Sales, and Paper Towne Goods. The business climate in Muskegon is very good. There are very few empty stores and there is strong merchant cooperation (on the Saturday before Halloween the stores offered treats and I help hand out over 1,000 cookies). The cookie shop is open three Sundays a year during the January Ice Fair, Summer Art in the Streets, and the September Fall Festival. The second step would be implementing a strong advertising campaign. I plan to begin six months of advertising in the local paper, the Town Tattler (circulation about 21,000), announcing the new ownership and inviting people in to meet the new Grandma Miller, and some monthly specials. Both the Tattler and Sentryman newspapers do public relations articles on new businesses and ownership changes. I will change the name to Grandma Miller's Cookie Pantry and use a pantry as a focus for advertising, flyers, and business cards in the shop. After becoming familiar with the day-to-day operations, I plan to employ one person (a relative) one day a week to learn the business in case of an extended absence. This will also allow me to visit the various industrial and office complexes to market cookie and muffin trays for business meeting and promotions. My contacts will be mostly with companies' seminar/group meeting planners. Cookie, muffin, and chocolate tie-ins to all major holidays, such as heart-shaped cookies for Valentine's Day and Sweetest Day, muffin birthday "cakes," cookies for Santa, and cookie exchanges. "Sweet Sixteen Special" offered every sixteenth of the month. Customers have to come into the shop to find out what the special is for that day. Can also use the day to offer free samples of new ideas. Promote the first full week of February, which is National Muffin Week. Offer a welcome wagon type of promotion to new residents of the Muskegon area, using published real estate closings. Develop a special recipe for a "morning cookie" not to be offered in the shop, but only for business breakfast meetings. Promote one day a week as D-Day (Dipit Day), for dipping customers' cookies in chocolate. On November 10, 1994, I visited Grandma Miller's dough supplier, in Holland, Michigan. She had originally started Grandma Miller's Cookies in three locations: Lansing, Grand Rapids, and Muskegon. After a death in the family of the initial cookie dough supplier, Ceceila offered the opportunity to buy the dough business. She subsequently sold the Grandma Miller's stores and moved to Holland and is currently involved with retail and wholesale business under the name of Jolene's Cookies. Cecelia has indicated her willingness to help with new ideas and products. My future plans for the business are to maximize sales potential, which may take several years. I anticipate the expansion of the gift basket market, a build-up of wholesale accounts, including the introduction of party planning. I believe both previous owners looked into franchising, but I do not see that as an option in the short run. Area competition is very small for the cookie and muffin business. The lunch business in downtown Muskegon consists mainly of Karen's Cafi across the street, which serves the quiche/croissant, sandwich, and dessert trade. One block away is Penny's Deli, which serves deli sandwiches, salads, and beverages. The Boothe Bar takes care of the hamburger crowd. There are few other eateries in town. Limited seating at Grandma Miller's (eight inside and two outside during the summer) has encouraged customers to phone in their orders and pick them up along with a drink and dessert. Two blocks away a coffeehouse has opened and stays open until 11:00 p.m. Although it serves some of the same muffins and cookies as Grandma Miller's, and the coffee bean prices are comparable, the coffeehouse attracts a different crowd than Grandma Miller's. The most difficult function is following the fine line of quantity overbaking and not having enough cookies later in the day. Despite a sophisticated cash register that totals an hourly sales figure, and detailed recording by Hannah, there is no set pattern of daily activity. One Tuesday could be a sellout and the next Tuesday there could be several bags of day-old cookies, which sell quickly the next day. Hannah has developed some recipes for bar cookies—using crumbled cookies as a base and adding a fruit topping and a "drizzle." These could be sold in the store or packaged for a catering truck. The store still looks good after almost nine years. The custom-made counters and cabinets are made of oak, with glass fronts, and good quality wallpaper makes for a neat appearance. Besides bringing in a pantry, I want to use an oak trim along the ceiling to give an overall cozy appearance. New wallpaper with matching material for curtains and for the liners of the cookie baskets will freshen up the sales area for a long time. I would like to put in a new floor covering and paint the back work area. Since this is going to be a one-person operation, I plan to add business interruption insurance to the overall business insurance package. I also plan to add a disability package to my personal health insurance. Attached is a current resume of my educational background and a work history. However, it does not reflect my creative talents, which I have used in an antique and collectible business and in extensive family party planning. I have taken a floral design class and mold my own chocolates. 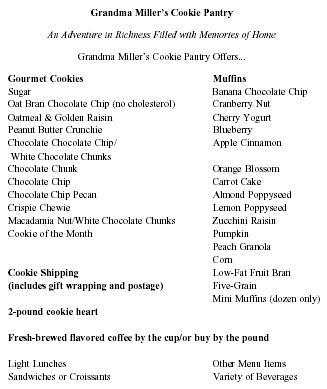 I hope to expand my business, Your Organizing Friend, through Grandma Miller's Cookie Pantry. Although my professional team is not complete, I have an attorney who is handling the closing and other aspects of the purchase and lease negotiations. I also have a CPA consultant, but he is a relative and won't be handling the actual accounting functions. Hannah's interest in Grandma Miller's is waning, and I feel that it is the right time and niche for me to devote my full-time and creative energies to the business. Business professional with proven effectiveness in sales, personnel, and consumer relations. Skilled in coordinating resources, people, and ideas to produce maximum results. Analytical, creative, and capable of working with minimal supervision. Interest and demonstrated ability in public relations, events planning, and fundraising. Residential: Marketed new and used homes and condominiums with effective advertising; researched financing to guide buyers through to closing. Commercial: Sold small businesses using financial analysis and research; negotiated details between buyer and seller, their attorneys, accountants, and landlords; marketed office space at the Center Point Building. Administered tests, conducted interviews, implemented special programs. Restructured and organized manual office systems to more efficiently meet the demands of a municipal agency. Project Management: One year as a field representative with Floral Worldwide Delivery Group (FWDG) and long-term association with the Muskegon Historical Society. Traveled nationally to audit FWDG's members' floral orders for quality to insure association standards, supported audits with written and photographic evaluations. Wrote monthly newsletter for historical society, prepared press releases. Planned fundraising events with proceeds ranging from $500 to $85,000, generated publicity for activities. Developed theme events for various individuals and organizations. Set up displays at various locations in Michigan. Sales included sharing information regarding antiques, their history, and use. Muskegon Chamber of Commerce; Zeeland Historical Society; Community Assistance Services, Inc. (group homes), board of directors.